Are you looking to get into golf? 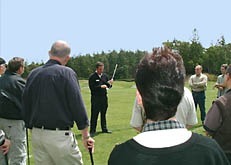 The Tyrrells Wood Golf Academy is an initiative designed with new golfers in mind. It provides the most comprehensive introduction to the game, giving members the perfect stepping stone into full membership of the golf club. Working alongside our experienced PGA Professionals, Academy members will have a unique opportunity to develop their golfing skills through regular instruction and sociable golf. Membership to the Academy runs for a 12 month period from the day you join and our aim is to get you to a level of on-course competency which will allow you to progress on to full membership of the golf club at the end of your year. For more information please submit the enquiry form on the right of the page or contact our PGA Professional Joanne Taylor at assistant.professional@tyrrellswoodgolfclub.com or by calling the Professional Shop on 01372 376025 (option 2).